First Line: I blinked my icy lashes but it didn't ease the brittleness of my contacts. When her husband's Aunt Dorothy comes for a visit and wants to do some research, Lottie discovers that you just don't deny a bestselling author such a request. Freezing western Kansas weather isn't the worst that the two women will encounter on this particular trip. Neither is finding the dead body of a young man inside the mausoleum of a Civil War veteran. No, the worst thing they encounter is discovering the tiny frozen body of an infant in the arms of a statue in the park. Lottie quickly has to transition from being a local historian to the lead investigator as head of the yet-to-be-built regional crime center. The team consists of so many members of Lottie's family that the man in charge at the Kansas Bureau of Investigation insists forensic psychologist Dr. Evan Ferguson join the group. Tension becomes almost unbearable as more bodies are found and as Ferguson seems to fight every decision the group makes. In order to take a tiny break from the mounting frustration, Lottie begins reading a commonplace book that was left with the historical society. Written by a desperate, shunned child, this handwritten book is going to have a profound bearing on Lottie's investigation. It's been too long since Charlotte Hinger's last Lottie Albright mystery. She is so adept at combining fascinating Kansas history with her mysteries that I never want to miss reading a single one. Only one thing prevented Fractured Families from being one of my best reads of the year: the killer was so obvious and over-the-top to me. Fortunately, there is much more to the book than whodunit-- and I loved the rest. Carleton County-- dubbed by one character as "the Bermuda Triangle for crime"-- can be counted as a character in Hinger's books. The weather usually makes its presence felt, this time as a ground blizzard that will have you reaching for extra blankets and thinking about the thermostat as you turn the pages. Two characters (besides Kansas) were stand-outs for me: Franklin Slocum, the young boy who wrote the commonplace book, and Aunt Dorothy "That's why I'm on the bestseller list" Mercer. The life that Franklin had to endure broke my heart, and Dorothy's skills and personality made me laugh while I admired her. 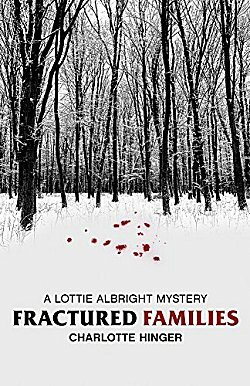 If you're like me and enjoy crime fiction with a strong dose of history, you simply cannot go wrong with Charlotte Hinger's Lottie Albright mysteries. I hope to be reading them for a good long time. I recently read the first book in the series and while I loved the historical aspects, the old diaries and newspapers, Lottie herself annoyed me a bit. And she cried too often for my taste. However, perhaps I should give the series another try since it's a shorter one.